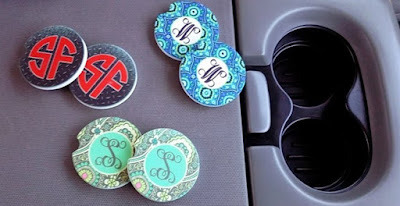 These very popular Personalized Monogram Car Coasters are back at ONLY $9.99 (Retail $19.99) - which sold out quickly last time. Tired of that mess in your cup holders? Who isn't?!?! Well you don't have to deal with that any more with our Personalized Car Coasters! This set of 2 car coasters fits perfectly into your cup holders. These make great Christmas, teacher, or any other occasion gifts! $3.00 for the first item and $1.50 for each additional item. US only. Estimated to ship by Wed, Jan 18.